As promised, the second episode of Telerik TV is now live! 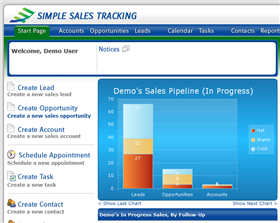 In episode two, Carl Franklin sits down with Shane Redlick from Consilium Solutions Corporation to take a look at a web-based sales team management application called (quite simply) Simple Sales Tracking. The site was built using Telerik's RadControls extensively- everything from RadChart to RadEditor- and it's another great example of how Telerik's controls are being used in the real world. Once you're done watching this episode of Telerik TV, you can even take the Simple Sales Tracking app for a test drive yourself via the freely available online demo. On a production side note, the Silverlight Media Player currently hosting the online episodes is not (yet) compatible with Silverlight 2 beta 2. If you have that version of the plug-in installed, you'll need to download the WMV for now. We're working on updating the site with the latest version of the player, so soon the order of the universe will be restored. Enjoy the new episode and look for another soon. Also, don't forget that your app could be featured on Telerik TV. If you're interested, click the "Submit My App" button on the Telerik TV website.